Roots & Revelry is located on the second floor of one of Birmingham’s beautiful old buildings, the Thomas Jefferson Tower. As you approach, take note of the odd iron structure on the top of the building. It’s one of the last remaining zeppelin docking stations; so if zeppelins make a comeback, the TJ Tower is way ahead of the game. But, we digress. On his current brunch menu, Roots & Revelry’s Chef Brandon Cain offers up delights ranging from old-school Southern mainstays such as buttermilk biscuits and sawmill gravy, shrimp and grits, and a properly made eggs Benedict, to more eclectic fare such as fish and grits, chilaquiles, chicken and waffles, or a wild mushroom omelette. The R&R full bar and top notch bartender are also prepared to serve up a little hair-o’-the-dog, should that be in order. Located in the bedroom community of Cahaba Heights, the Fig Tree Café (lovingly referred to as “The Fig”) offers an intimate setting and some delightful Southern-inspired cuisine. On his current brunch menu, Chef Jon Holland offers up a number of signature dishes ranging from biscuits and gravy to steak and eggs. In the mood for a little jerk tuna ceviche? This is your place. Can’t decide? Try the Southern charcuterie plate for a little variety. 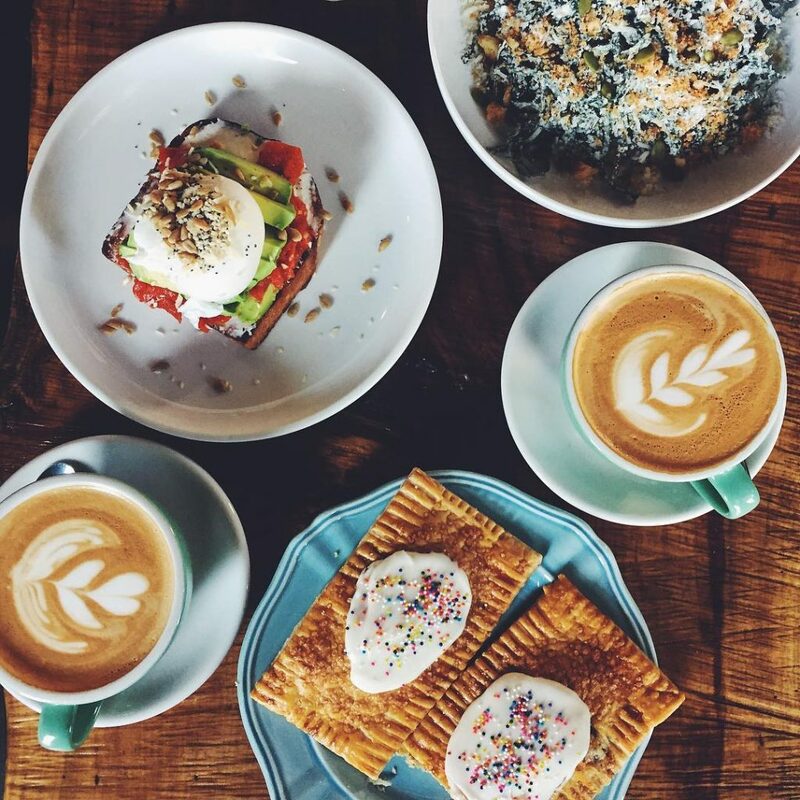 For all you early risers out there, we recommend brunch at the Woodlawn Cycle Café. Here, you can be good to your body with muesli, a golden beet bowl, or granola… or you can be moderately good to your body with a nod to your soul with their Tijuana Brass plate, which features chorizo, a fried egg, greens, house-made naan, and a mango salad. OR…. You could go for the rabbit ragú with sautéed seasonal vegetables, pistachio-mint yogurt, and a garnish of sliced almonds, currants, and mint. 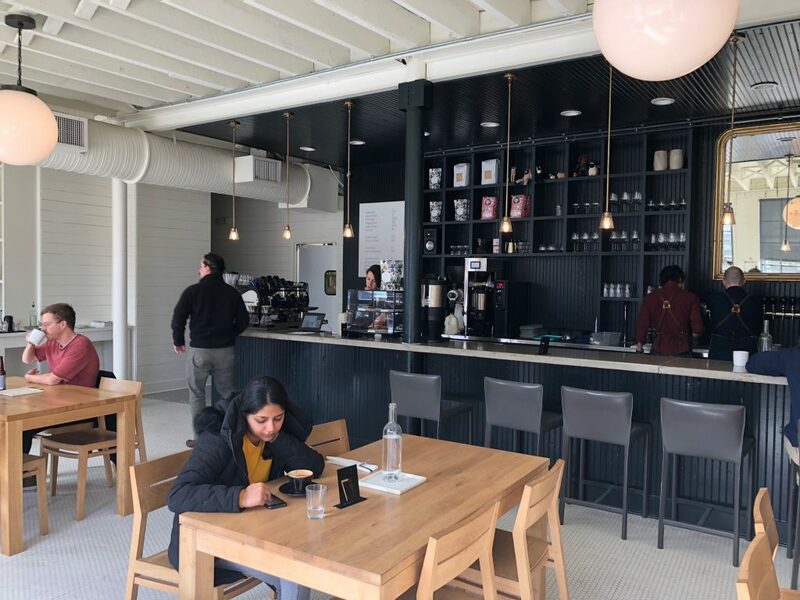 Bottom line: if you’ve grown bored with traditional breakfast fare and want to try a real treat, Woodlawn Cycle Café is your jam. The Essential may be a relatively new entree to the Birmingham plate, but the owners, Chefs Victor King and Kristen Hall, certainly aren’t. At their first venture, Feast & Forest, the two outgrew their digs and ended up renaming the restaurant and moving it to tony Morris Avenue. Brunch here might be as simple as one of Chef Hall’s homemade brioche doughnuts or as hearty as their Essential Hash, which brings together potatoes, grilled onions, slow-cooked pork shoulder, pickled peppers, salsa verde and is topped with two farm-fresh, fried eggs. Shall we leave it at: you’ll not go hungry. After all, that’s essential. With a decidedly Latin flare, Rojo’s brunch gives a wholly new meaning to the notion of spicing up your weekend. Entrees are all priced at a reasonable $8.95 and range from chorizo con huevos, to a brunch sandwich featuring scrambled eggs, cheddar cheese, jalapeño bacon, and sliced avocado. Want to take things to the next level? Try adding a little habanero puree – but be warned – it’s hot enough to be banned in some airports. Here, you might want to accompany your brunch selection with a glass of sangria, a margarita, or the more traditional brunch drinks. Consider a bloody maria (same as a bloody mary, only with tequila) if you want to live in both worlds. If you’re in the mood for something different, head south of the border (and, no we aren’t sending you down into Bibb county somewhere). Executive Chef Neville Baay’s brunch at El Barrio (which is actually located right down town) features a lively mix of eats ranging from the ol’ standby, huevos rancheros to sopapillas for breakfast, made with pork carnitas, roasted apples, queso fresco, candied apples, and citrus; to chilaquiles with either shrimp or chicken, prepared with poblano crema and featuring spiced cherry tomatoes and radishes, zucchini, and fava beans. Pair any or all of that with some sparkling grapefruit sangria or a michelada and you’re bound to be muy satisfecho. It would be hard for us to say it better than Trattoria does on their website: “A pizza place that does Sunday brunch? Yup. The almost famous brunch menu seamlessly weaves Italian ingredients and Southern know-how with their mascarpone stuffed french toast, breakfast pizza topped with local farm eggs, seasonal frittatas, biscuits ‘n gravy, and more.” Che figata! Want to know more about Trattoria’s “almost famous brunch” (it really is, by the way)? Check out the menu. There’s nothing common about Avondale Common House’s brunch. Chef William Rogers and his wife, Ellen, have populated their brunch with such delights as salmon toast, a build-your-own eggs benedict, and churro French toast. In the mood for the basics? Check out their Avondale Common House Breakfast with eggs cooked-to-order, homemade biscuit, fruit, potatoes or grits, and your choice of meats. Or, live a little and go for the fried green tomatoes topped with citrus blue crab relish, micro greens, and stone-ground mustard cream. 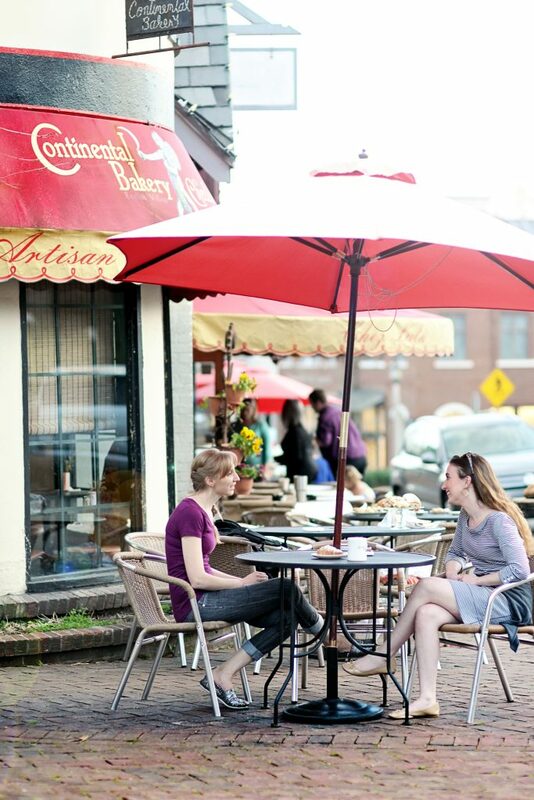 Perhaps one of the finest pleasures Birmingham has to offer is enjoying crêpes or a homemade croissant at a small café table outside of Chez Lulu on a Sunday morning. If your idea of brunch is to be magically transported to an intimate European café, where the coffee is hot and fresh, and where you can enjoy pain aux raisin or a light tarragon chicken salad, or perhaps the tarte du jour served with a small house salad, then you simply have to cross over the mountain into English Village for a Sunday morning at Chez Lulu. Chef Carole Griffin of the Continental Bakery and Chez Lulu has done an amazing job of transmogrifying a small restaurant on the south side of Birmingham into a delightful French café. Her brunch is the epitome of this bit of culinary alchemy. The pairing of Dram and Avo can be found in the heart of Mountain Brook Village. Brunch here marries old South delights with a certain cosmopolitan panache. Here, you’ll find mini buttermilk biscuits served up with Tennessee sorghum and country ham with red-eye gravy sharing a menu with an Embarcadero Benedict, featuring poached eggs, prosciutto, and spinach served up on an English muffin with Maltese sauce. And with a name like Dram, you know the brunch drinks are going to be special. We recommend the Derby Mary, a new take on the old brunch standby, made with Bulleit bourbon and garnished with country bacon. Chef James Boyce’s vision of American-French cuisine influenced by the South comes through loud and clear in his brunch menu. From the Alabama Duroc Pork Scramble, which brings together slow-cooked, pulled pork shoulder, pepper jack cheese, braised collards, and potato and sausage hash, to the smoked salmon Benedict, you’ll find everything at Galley and Garden designed to give your senses a Sunday morning wake-up. Pair your morning eats with a classic Sazerac, or with a That’s the Spirit, a distant cousin of the Negroni, made with gin,, St. Germain, Aperol, and citrus flavors. Start your Sunday morning with oysters or an authentic Old Mobile Style West Indies Salad, then bring on the entree. Dyron and Sonya Powell’s vision of a place that celebrates the low-country culinary delights of the South is brought to vibrant life by Head Chef Randall Baldwin. Chef Baldwin’s brunch menu attests to that. From beignets just like your Gramère made them to grilled Carolina quail served up with a fresh farm egg, to cast iron buttermilk pancakes, you are certain to find something delightful to start your Sunday off. Hooo boy! So, y’all, that wraps up a dozen brunch joints without even touching on all of the incredible breakfast eateries we have here in the magically delicious city. Guess we’ll just have to save that for another morning’s work.